Everyone has a theory on what makes a great leader, and with good reason. Leadership is a quality that’s important for success and yet so difficult to define. Jennifer Bridges, PMP, cuts through the noise and reveals five of the best leadership theories. There’s so much written about leadership, Jennifer said, that it can be intimidating. But it’s important to overcome that sense of intimidation because leadership explains why some leaders, teams and companies succeed and others don’t. These arenas of leadership range from running a business, to managing a project, to simply completing a task with team collaboration. A strong understanding of leadership provides us with a variety of legitimate options for different scenarios, and helps a person set up themselves, their team or company for success. Therefore, Jennifer strongly suggests people are more intentional than reactional when it comes to leadership. What is leadership? Jennifer defined it as a process whereby a person influences a group of individuals to achieve a common goal. But it’s not a position or title that is given to you. Nor is it a position you get promoted to: it’s something you must earn. The origins of how we have come to define leadership have historic roots. Many might remember the great man theory, which dates back to the 1800s and speaks to men with dominant personalities. They were destined for greatness due to having innate characteristics that made them leaders. The idea of a born leader, and that leaders are born male, is obviously outdated and has since been challenged. Today, there are many theories of leadership that attempt to explain what makes a great leader. Transformational: James MacGregor Burns was a political sociologist in the 1700s, who saw leadership qualities falling under two types. Transactional leaders are those who influence others by what they offer in exchange for their help. Transformational leaders are connected to their followers in such a way that it raises the level of motivation and morality, committed to a collective good. Four factors play into transformational leadership: idealized influence, inspirational motivation, intellectual stimulation and individualized concern. Leader-Member Exchange: This is a leadership theory based on that there are two groups in opposition, the in-group and the out-group members. Think of it like high school, where there’s the popular kids and the outcasts. Adaptive: An adaptive leader is one who can mobilize people to act on tough challenges, even if the solutions to those challenges are not readily apparent. Strengths-Based: The belief that it’s individual strength that leads to successful leadership; when people use their strengths and competency to lead, they’re sure to do a good job. Servant: Popularized by Robert Greenleaf, the servant leadership theory places the needs of others over their own self-interest. The idea is that you serve first, shifting the power to those who are being led. Pro-Tip: Remember, we wrote that the debate of leadership being inbred versus whether it can be learned is still ongoing. Most likely it’s a spectrum. Wherever you land on that spectrum, leadership training is an option. One thing everyone agrees on is that a leader isn’t complacent, and you shouldn’t be either. Take it Further: Leadership is often enhanced when combined with management. Read our blog post “Leadership vs. Management, What’s the Difference,” and learn how to blend leadership and management skills to be even more effective. 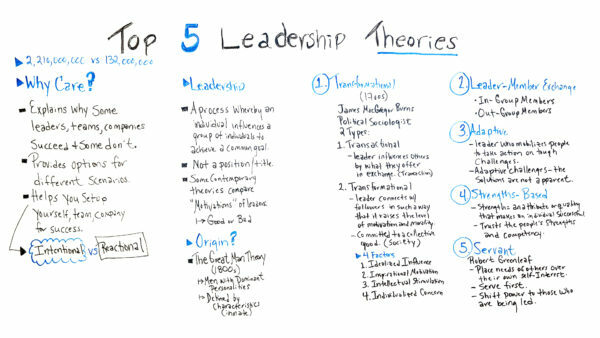 Today, we’re talking about the top five leadership theories. Well, at this moment and time, I just did a search on how many people are searching for leadership. There were 2 billion people. I also looked and did a search on how many people are interested in leadership theories? Over 132 million. So, obviously, this topic has a little bit of interest and people do care. So, why do we care? So, the reason we care about leadership theories is they explain why some leaders, some teams, some organization, and companies succeed and why some don’t. It also provides options for different scenarios giving you different options for different theories or different ones to apply. It also helps you set up yourself, your team, your company for success. So, it helps you be more intentional versus reactional. So, we wanna look at leadership. I always like to clarify specific terms, specifically this one because a lot of times there’s misuse of what leadership means or what it is. So, leadership is a process where an individual influences a group of individuals to achieve a common goal. It’s not a position or title. Sometimes people think they may be a leader just because they have leader in the title but it’s really not. And there’s some contemporary theories that compare different motivations of leaders. Therefore, we may all know of different leaders where we think maybe they have good motivations or bad motivations. Historically, we can look back at some of the leaders and have insights on that. So, let’s look at where did all of this start? I would submit that leadership didn’t, you know, just start recently, in the past few years or the past decade, it’s been going on all along. I mean, people, innately exude leadership qualities depending upon what the scenario is. So, let’s look at some of the origin. So, it began to be written about and talked about in the 1800s with, ladies, don’t panic, the great man theory. Where the great man theory really talked about leadership being defined by characteristics, more innate characteristics. Talking more about men with dominant personalities. So thank goodness over the years, things have changed and people continue to study and research leadership. Is a person born a leader? Are they trained or taught to be leaders? So, let’s look at some of these five leadership theories. The first one is transformational. And it began to be documented in the late 1700s by James MacGregor Burns, who was a political sociologist. And he documented and did a lot of research on two specific types of leadership. One is transactional, the other is transformational, which probably you’ve heard of both. But transactional is that the leader influences others by what they offer in exchange, therefore, the transaction. Transformational, what I wanna spend a little more time on is where a leader connects with the followers in such a way that it raises the level of maturity and morality. You may think of they’re committed to a collective good or societal good, helping for the greater good of all mankind. So, there are four factors that are documented as related to transformational leadership where a transformational type leader exudes idealized influence. Like the way they carry themselves, and the way they talk to other people, their choice of words. Some people call that charisma. There’s also inspirational motivation, how they encourage others and inspire others into action. They also invoke intellectual stimulation where they have people maybe think more deeply and maybe change their perspective on things. And also individualized concern. Although those leaders are committed to a collective good, they’re also concerned about the individuals and how those individuals contribute and what the individual concerns are. That’s why people feel like transformational leaders are so powerful. So, let’s look at number two. Number two is the leader member exchange where oftentimes we can think of there are in group members and out of group members where the in group members align, they kind of think alike like the leader, they kind of resonate. The out of group members maybe don’t, maybe they’re rebellious to the leader’s ideas. Sometimes it’s also…if you think about students in school, there are the people who are popular or not popular. And so, then the third one is adaptive where a leader who mobilizes people to take action on tough challenges. Sometimes you may have heard of adaptive challenges and what those are is challenges where the solutions are not readily apparent. Then there’s strength-based leadership where today we see a lot of assessments, you may have seen the Strengths Finders. I’ve personally written about this, about a book called “Optimize Your Thinking: How to Optimize Your Performance Potential,” where I’m looking at thinking styles and arc types. But this one is talking about a strength, an attribute, or quality that makes an individual successful. And also by using this strengths-based leadership is really trusting in your people strengths and competencies. Then more and more today we’re hearing of more servant leadership. So, what that is there’s a lot written by Robert Greenleaf, and a servant leader places the needs of others before their own self-interest. They’re really all about serving others first and shifting the power in those who are being led. So, as you can see there are different theories, there are different options and the best thing about studying leadership theories where, you know, some people succeed or some people don’t is the theories give you options to try for different scenarios and you can test and measure. You can have a blend, or you can mix them, or use them at different times. So, I hope this makes you successful. And if you need a tool that can help you apply your leadership theories, then sign up for our software now at ProjectManager.com.